I’m gonna warn you up front … this a long post. I followed a couple bunny trails. 45° at 5:45 so I closed the bedroom window. Yeah I like it cool to sleep – but, let’s be real, there’s a limit, okay? Burrowed back under the covers and threw my cold arm across my sleeping wife. Yeah I’m that kinda guy. Sunday we got the new book that our class is going to be studying. “Unafraid” by Adam Hamilton. I was ready for some good news so then I read that our church’s Lenten Clothing Drive had concluded with so much clothing donated that we had to rent a truck to haul it. Speaking of clothing, this was once again laundry day at the Williams household (RVhold?). The groundskeeper was mowing this morning. I hoped that he would get to our site while we we’re doing laundry. But he didn’t. I remember helping my mother do laundry. Back then laundry day started with me bringing the big galvanized washtub in from where it hung on the back porch. The tub would go on the stove to heat water for the wringer washing machine. The first load of water went into the washing machine. Then a second tub was moved to a stand next to the machine under the wringer. Bluing went into the second tub which was for rinsing the laundry. While the machine ran Mom would stand there with her “laundry stick” and keep pushing the clothes further down into the washer. 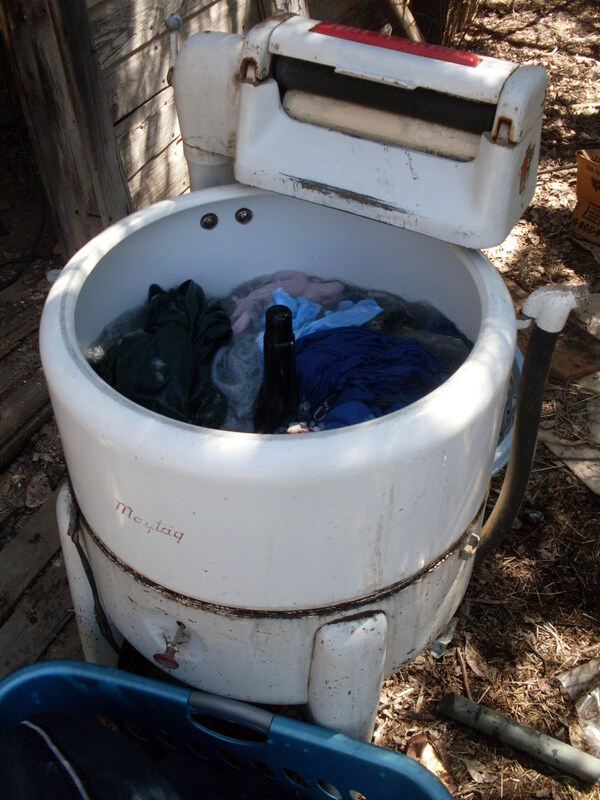 Eventually the washed clothes were run through the wringer into the rinse water. The laundry stick was them deployed to agitate the clothes in the rinse water. When she was satisfied, the clothes were run through the ringer once or twice and into the laundry basket (which originally held a bushel of peaches). Being young and strong I carried the basket out to the clothesline. I couldn’t reach the lines so I would hand Mom a piece of clothing while she grabbed clothes pins from the bag hanging on the line. Once everything was on the line, she would go in and fix it lunch. After a day in the sunshine and wind the clothes were taken down, brought inside and folded.